Home About Universe Aliens Asteroids Beginners Info Infographics Missions NASA Planets Scientists sky Space Exploration The Huge "Asteroid" Set To Fly Past Earth Today Is Actually A Dead Comet - And It Looks Just Like A Skull! The Huge "Asteroid" Set To Fly Past Earth Today Is Actually A Dead Comet - And It Looks Just Like A Skull! 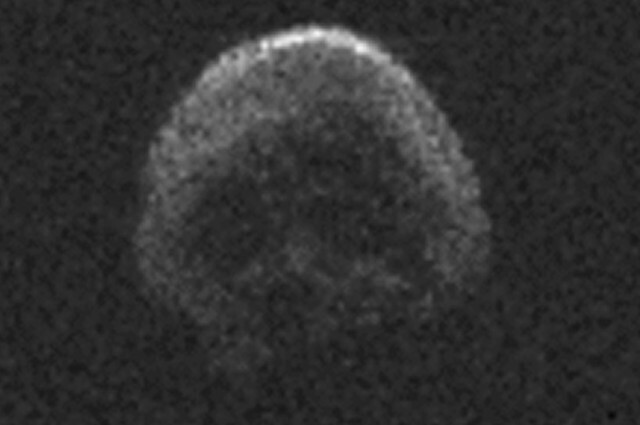 The Universe has a very special treat for us this Halloween: a skull-shaped dead comet posing as an asteroid. The massive space rock will whizz past the Earth today, providing the best chance for radar astronomers to observe such an object for many years to come. The “asteroid”, officially named 2015 TB145, will safely pass by the Earth on Halloween around 1pm EDT (1700 UTC) at a distance of 486,000 kilometers (302,000 miles) — that’s 1.3 times the distance from the Earth to the Moon. Using a combination of optical and radar observatories, including NASA’s Infrared Telescope Facility (IRTF) on the slopes of Mauna Kea, Hawaii, scientists observed the large space rock and made some surprising discoveries. First discovered on Oct. 10, scientists thought they were seeing a massive asteroid with a very elongated orbit. However, new observations made on Oct. 30 with the National Science Foundation’s 305-meter (1,000 foot) Arecibo Observatory in Puerto Rico reveal that 2015 TB145 may actually be a dead comet, having shed all its volatiles after many orbits around the Sun. This would also help to explain its funky orbit, which resembles the typical orbit of a short-period comet rather than an asteroid. "We found that the object reflects about six percent of the light it receives from the sun,"said Vishnu Reddy, a research scientist at the Planetary Science Institute, Tucson, Arizona. "That is similar to fresh asphalt, and while here on Earth we think that is pretty dark, it is brighter than a typical comet which reflects only 3 to 5 percent of the light. That suggests it could be cometary in origin -- but as there is no coma evident, the conclusion is it is a dead comet." The new measurements also tell us that the celestial body is much darker than previously thought, reflecting only about six percent of the light that hits it. This also tells scientists that we are dealing with a cometary body as comets are typically darker than asteroids. Its dark color helped to conceal its true size, and scientists were surprised to find that it is spherical in shape and measures approximately 600 meters (2,000 feet) wide — roughly the size of 5 ½ football fields. The zombie comet is speeding through space at 126,000 kilometers per hour (78,293 mph) and rotates once every five hours. Arecibo also provided us with the first radar images of the dead comet’s surface and we see an eerie view perfectly suited for Halloween. Darker eye socket-like features on the surface — mostly likely craters formed over time by melting ices or impacts — give the comet a skull-like appearance. But that’s really an optical illusion explained by a phenomenon known as pareidolia, which tricks our brain into seeing patterns that aren’t really there. "The IRTF data may indicate that the object might be a dead comet, but in the Arecibo images it appears to have donned a skull costume for its Halloween flyby," said Kelly Fast, IRTF program scientist at NASA Headquarters and acting program manager for NASA's NEO Observations Program.